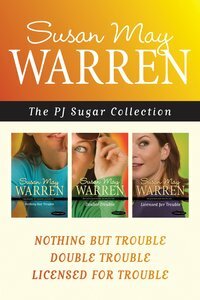 This collection bundles all 3 volumes of Susan May Warren's delightful PJ Sugar series together in one e-book, for a great value! It's not fair to say that trouble happens every time PJ Sugar is around, but it feels that way when she returns to her home town, looking for a fresh start. Within a week, her former teacher is murdered and her best friend's husband is arrested as the number-one suspect. Although the police detective investigating the murder-who also happens to be PJ's former flame-is convinced it's an open-and-shut case, PJ's not so sure. She begins digging for clues in an effort to clear her friend's husband and ends up reigniting old passions, uncovering an international conspiracy, and solving a murder along the way. She also discovers that maybe God can use a woman who never seems to get it right. With one solved case under her belt, PJ Sugar is ready to dive into her career as a private investigator. Or at least a PI's assistant until she can prove herself to Jeremy Kane, her new boss. Suddenly PJ's seeing crime everywhere. But is it just in her head, or can she trust her instincts? When she takes on her first official case-house-sitting for a witness in protective custody-Jeremy assures her there's no danger involved. But it soon becomes clear that there is someone after the witness ... and now they're after PJ, too. About "Nothing But Trouble / Double Trouble / Licensed For Trouble (Pj Sugar Series)"
PJ Sugar receives shocking news that she?? ?s inherited the Kellogg family mansion. Though she has no idea why, the timing is perfect?? ?PJ has clearly worn out her welcome at her sister?? ?s house. Unfortunately, the mansion is in shambles, and PJ is short on cash. Rescue comes in the form of Max Smith, a mysterious handyman willing to trade his services for PJ?? ?s investigative skills. But PJ already has a full docket with cramming for her PI license and nurturing a growing romance with her boss, Jeremy Kane. Can she take on Max?? ?s case without dropping the ball?